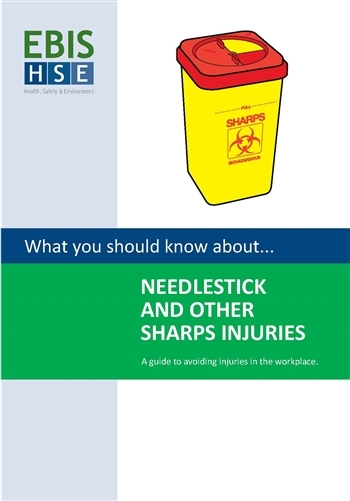 This booklet is designed to help employers to comply with the Sharps Regulations. The regulations require healthcare employers and contractors who work on healthcare promises to ensure their staff are provided with appropriate information and training. 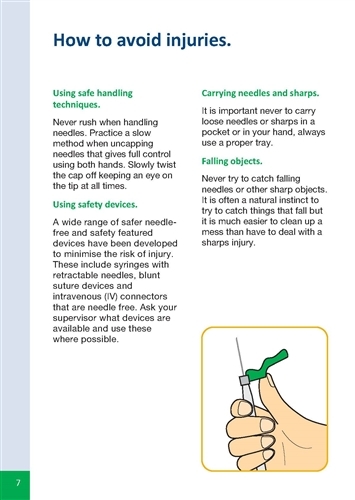 It is an easy to understand practical guide to avoiding needlestick and other sharps injuries, with advice on dealing with injuries. 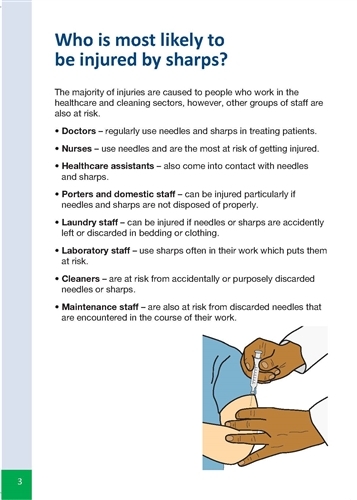 It is aimed at staff who work in areas where needles and sharps are used, such as healthcare, and also for staff in cleaning and maintenance roles who may encounter discarded needles. It is used for staff inductions, training, refresher training and also provided to contractors or agency staff who come onto company premises to undertake work. The booklet format is A5, 16 page, full colour, clearly written and illustrated and includes a Check Your Knowledge section to test understanding. What are needlestick and sharps injuries? Who is at risk of being injured? What causes needlestick and sharps injuries?